I am curious what Santa brought you for Christmas. Please post a picture of your fun new present at our facebook site. Just look up Arrow Sewing Cabinets after you login to facebook. Hey everyone, it’s me again, Olivia. My owner ran out for her Starbucks fix, so I thought I’d take the opportunity to sneak on here and say “Thank You!” to all of the folks that supported me by posting a comment. Even Gidget stopped by! Guess What? It actually worked! My owner has started to do some sewing on me. Now, it wasn’t a big project, but it was fun. We are in the middle of making some holiday gifts! 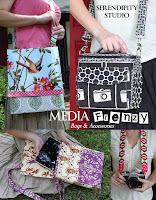 We’re starting off with the Simple Wallets from Kay Whitt’s great new book, Media Frenzy. They are oh-so-cute and very quick and easy to make, so they really don’t show my full potential, but at least she didn’t haul the sewing machine off to the dining room table this time! Maybe she thinks she needs to break me in gently, but I’ll tell ya – I am ready to sew, sew, sew! There is still a big roll of fabric over in the corner, so I’m hopeful that I’ll be used for a major sewing project soon. Say, maybe you could post some pictures of projects that you’ve made over on Arrow’s Facebook page. That may help! I’ll try to sneak back on here and post some pictures of the finished wallets another day. Uh oh, I smell a Vanilla Latte, so I’d better go!